We are seeking a suitably qualified and experienced Engineer to coordinate a team of engineers and technical staff in the development of a range of civil engineering projects. You will coordinate the team in planning of infrastructure and transport initiatives to meet the demands of a growing city through strategic planning documents and service planning. This will include having a key role in the development of the annual and 10 year capital works program for civil infrastructure including, roads, bridges, drainage, footpaths and traffic management. You will be responsible for the preparation of project briefs and reports and the development of strategic plans and policies. This will include managing the approvals for civil works in relation to subdivision and other works by authorities and property owners. To be successful in this role will require you to have proven experience in asset and contract management, sound knowledge of budgeting and relevant accounting and financial procedures. You will also have demonstrated managerial experience as an effective leader to direct, lead and develop staff into an efficient and enthusiastic team. If you require any further information regarding this position, please contact Brett Martini, Manager Engineering on (03) 5434 6371. Applications addressing the key selection criteria must be received by 5pm, Monday September 24, 2018. 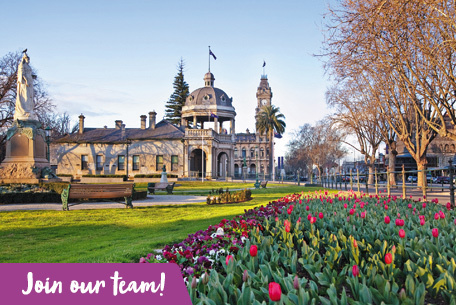 The City of Greater Bendigo is a proactive and dynamic employer, delivering more than 100 services and working with our community to be the world’s most liveable community. The City is an equal opportunity employer and encourages applications from people with diverse cultural backgrounds, including Aboriginal and Torres Strait Islander people, and people of all abilities.